The wave of low-cost hardware success is unstoppable and now the marketplace is more competitive than ever. The inventiveness of the maker generation is finding its way into industry with cost-effective hardware, open source platforms and fresh ideas. The wave of low-cost hardware success is unstoppable. Anyone thinking of low-cost hardware has developer boards front of mind: Raspberry Pi, Arduino or Beagle Bone. Since its launch in 2012, the Raspberry Pi has an amazing success story. With over 17 million devices sold worldwide, Raspberry Pi is the most popular single-board computer of all time. This mini-PC is the initiator of the low-cost trend. But the Raspberry Pi has now found itself in a competitive market place as more developer boards try to emulate its success. From new one-board controls to accessories and extensions, the market is constantly seeing innovation. Shields, hats, power supplies and sensors – now a whole hardware ecosystem is available with the minicomputers. Developments in performance and computing power have opened a whole host of new possibilities for mini-PCs. 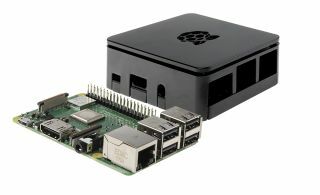 The Raspberry Pi initially had limited computing capacity and was primarily used by students for study or hobby projects, but it quickly became apparent that more was needed from the small format. The latest model, the Raspberry Pi 3B+, now offers a 1.4GHz quad-core processor with 1024 MB of memory and gigabit Ethernet. The active developer community provides guidance for fellow users to make it easier for people to get started in electronics. The Raspberry Pi is being used in an industrial environment more often than before, either as a controller in prototype development or as a fully-fledged industrial control system. The big advantage of a Raspberry Pi is, without question, the low price, which keeps the barriers to entry particularly low. For around £25, you can get a standard board and a wealth of possibilities. Any missing interfaces can now be added by a range of shields or hats. In addition, developers are finding they can work much more independently with mini-PCs. Solutions like open source developer portals are available to refer to. Most of the time, the systems are based in Linux but there are also freely available software libraries with helpful developer forums. Working with low-cost hardware offers unimagined flexibility. Developers can find their own solutions to specific problems. You can go your own way or test or expand systems without much financial investment. When a new interface is needed, it is usually easier and faster to integrate it via an open source environment. By contrast, a developer who relies on a proprietary control system will have to wait until the right extension has been developed and launched by the appropriate company. Here we see a clear paradigm shift: With low-cost hardware, developers can take their projects into their own hands, contribute ideas and find solutions. This saves valuable development time and money. In a market environment that is becoming more dynamic and relying on rapid innovation, this is a key advantage. Electronics have developed rapidly in recent years. It is becoming increasingly clear that speed has become a decisive factor to be successful in this market. The low cost and ease of implementation make hardware like Raspberry Pi a great solution for SMEs. However, to compete with the bigger companies SMEs face the challenge of digitisation. But unlike the larger players, they lack the funds for costly investments. So where should these companies start? Low-cost solutions with single-board computers offer small and medium-sized enterprises a great opportunity to tackle digital transformation. Raspberry Pi bundles with all the accessories needed for integration are a handy solution, giving SMEs the simple and practical solutions they need in order to make successful use of digitisation. In measurement, control and control technology (MSR), developer boards like Raspberry Pi offer companies new innovative opportunities. When used in harsh industrial environments, the Raspberry Pi can reach its limits though. Due to the compact size of the computer it already has slightly elevated ambient temperatures. The core temperature can rise sharply, leading to significant performance losses. Additionally, the microSD cards used as fixed storage allow only a very limited number of writing cycles and are not suitable as remnant storage, which is why they cannot meet industrial requirements. The 3B+ model does come with G-Ethernet and WiFi connectivity - essential prerequisites for industry 4.0 applications. But industrial interfaces such as RS485 or CAN are still missing. This means that using Raspberry Pi in industry is only possible if you add the right extensions. An interesting market has now formed for shields or hats for a range of functionalities. The PiXtend is a professional extension board for the Raspberry Pi that can be used for control tasks as well as a learning environment for control, circuit and software technology. On industrial-grade features, it brings serial interfaces (RS232, RS485 and CAN Bus), remote storage and the ability to monitor in real-time. In addition, it withstands ambient temperatures of up to 50 degrees and can be used directly in the control cabinet thanks to hat rail casings. The Andino X1 Kit combines the Raspberry Pi and Arduino to create an industrial solution for adapting digital inputs and outputs for a voltage of 24 volts. Thanks to its own microcontroller, precise signal pre-processing and adaptation of signaling devices and actuators is possible. In addition, the Andino X1 protects all essential interfaces of the Raspberry Pi according to current industry standards. The supported digital entrances and outputs are separated and prevent overvoltage of the Pis. The Revolution Pi family offers a Raspberry Pi-based open and modular system for a low-cost industrial PC. The three basic modules available are each equipped with a highly efficient DC-DC converter for the power supply and generate the 24 volts of operating voltage common for control cabinets. An elaborate protective housing guarantees unimpaired function even in the event of massive disturbances on the power supply system and complies with the EN61131-2 standard. The RevPi Connect base module has been specially designed for use in the IIoT sector and has more interfaces, including two Ethernet interfaces, each with its own MAC address. This means the module can be used simultaneously in the automation network, as well as be integrated into the IT network and transmit data. Depending on your requirements, the Revolution Pi can be used through digital or analogue I/O modules to build an industrial control system. There are also different versions for these expansion modules. They each have 14 or 16 entrances and exits, which are separated from the logic part with the PiBridge. They are protected against disturbances according to EN 61131-2 and temperatures of 40 to 50 degrees Celsius, and up to 80 per cent relative humidity. In addition, the system can be integrated into an industrial network through a field bus connection. In keeping with open source tradition, both the source code and all schematics support an open exchange and collaboration-based developer community around their products. As seen from just these three examples, developers today have many options when it comes to low-cost developer boards. This is only the beginning of the revolution, but the latest product launches show a clear trend: low-cost hardware is becoming more and more relevant in companies. The students that once worked on hobby projects with the Raspberry Pi who are now business system developers need a good and efficient solution fit for industry use. With accessories now available, there are products which will already be familiar to these former hobbyists, allowing them to develop solutions and operate independently of manufacturers. Companies benefit twice from this. They reduce development costs and could provide new services to develop new sales opportunities or business models, or to open new markets. The low-cost hardware revolution is set to continue.